In Ivano-Frankivsk oblast the Third phase of joint EU/UNDP Project “Community Based Approach” was officially launched today. 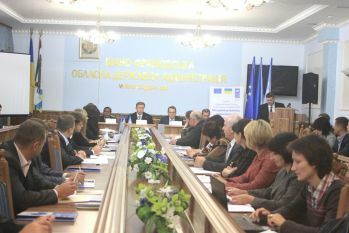 The presentation took place on 8 October 2014 during regional seminar under participation of Head of Oblast State Administration Oleh Honcharuk, Head of Oblast Council Vasyl Skrypnychuk, International Project Manager of EU/UNDP Project “Community Based Approach” Jaysingh Sah, Monitoring and Communication Specialist of EU/UNDP Project “Community Based Approach” Sviltana Slabinska, leadership of rayon state administrations and rayon councils; and heads of village and city councils. During the launching of the Third phase of the CBA Project a Partnership Agreement was signed with Ivano-Frankivsk oblast state administration, Ivano-Frankivsk oblast council and UNDP. “Today any efforts aimed to reduce energy consumption in industry or heat economy of households is particularly important. 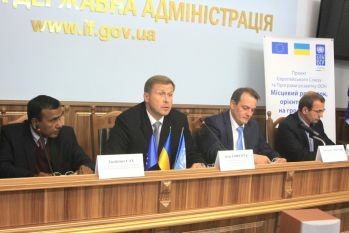 Implementation of energy efficient microprojects of condominiums and in the area social infrastructure, which will be implemented in the settlements of the region under the CBA Project support, will be one of those concrete actions that everyone could see in Prykarpattia”, stressed the Head of Ivan-Frankivsk State Administration Oleh Honcharuk. The Third phase of the Project will support local authorities in dissemination of best practices and experience in participatory planning and further dissemination of the community based approach in Ivano-Frankivsk oblast. The Project activities will focus on rehabilitation of social and communal infrastructure in the area of energy efficiency, health care, environment, water supply, rural economy. The Project will support Ukrainian Government in implementation of decentralization reforms and in dissemination of innovative approaches for participatory planning and for promotion of sustainable social economic development on local level through the knowledge management hub and through implementation of the appropriate courses into curriculum of 20 universities. Implementation of the first phase of CBA Project commenced in Ivano-Frankivsk region during February 2008. First phase was succeeded by a second phase in July 2011. Over these two phases 125988 of men, women and children of the region have benefitted from improvement in 28 schools/kindergartens, 16 healthposts, 2 water supply, 14 street-lightning, 5 environment and so on. This happened through joint effort of the citizens, oblast/rayon/local level governments, CBA Project and the private sponsors.